For this episode we focus on a woman who embodied sass, drive, creativity, brains, bravery and heart. She was a journalist, a novelist, an adventurer, an inventor, an advocate for social reform and did it all under a name that wasn’t her own! 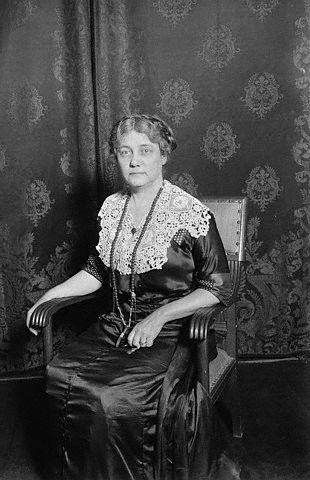 Elizabeth Jane Cochran was born May 5, 1864 in Cochran’s Mill, PA. Her father, Judge Michael Cochran was a self made man who had purchased a great deal of land, and several of the businesses- changing the name from Pitt’s Mill to Cochran’s Mill was a no-brainer. Judge , a widower, had ten children in various ages by the time he married Elizabeth’s mother, Mary Jane. They had two other boys before Elizabeth was born. Mary Jane dressed her daughter not in the dark blacks and browns as was the custom at the time, but in pinks earning young Elizabeth the nickname Pink. What a colorful name for a girl who was rough and tumble, but smart. The family was very affluent and built a beautiful, large home on several acres . One year later, when Pink was six, tragedy occurred and her father died. Although he was a lawyer and a former Judge, he died without a will. Mary Jane was forced to sell their beautiful home, and the family moved to much less lush surroundings. Of course, we will tell you the rest of the tale in the podcast, but let’s just say that the family hit some hard times. Mary Jane had a less than successful marriage, Pink had a less than successful education, and the family saw a gritty side of humanity. But these times taught her survival skills, to use her wits, to guard her heart, and so many other lessons that would serve her well in the exciting adventure that was her life. It was during the floundering years that Pink read an article in the Pittsburgh Dispatch that would change her life. Enraged with the message, she penned an anonymous letter signed, “Lonely Orphan Girl”. 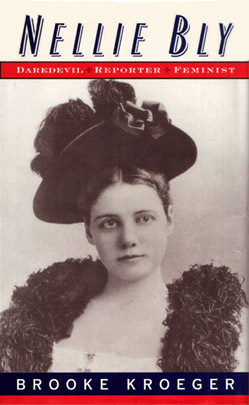 The letter led to a job, and a nom de plume based on a Stephen Foster Song, Nelly Bly. We chat about her days at the Pittsburgh Dispatch and her first adventure in Mexico as a correspondent (and we won’t hold the fact that she didn’t care for peppers stuffed with cheese against her). We talk about the nerve of her move to New York, her wit and schemes that landed her her first undercover assignment, “Ten Days in a Mad House”. Nelly may have been trying to earn a living, stand out and survive in a male dominated world, but her daring adventures led to social reform,too. BONUS! 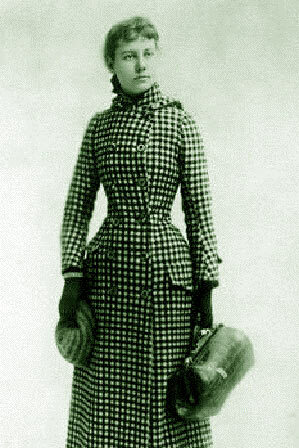 The professional life of Nellie Bly was legendary and by the age of 25 she was the most famous woman in the world.… ROCKSTAR! She led her readers Around The World in 72 Days and into story after story trailblazing a trend, not only in stunt journalism, but in WOMEN journalist. She wrote in a very readable style, not unlike contemporary bloggers or columnists (leading Susan to a really daft theory of time travel). Personally, she also had some adventures and very quick romance that led to marriage to a man 40 years her senior and a second career as a head of industry. But, ten years later, her husband died and she was sent into financial ruin thanks to some scrupulous employees. 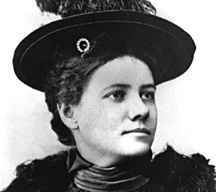 But, this is NELLIE BLY! She doesn’t whine into her fur! No! She goes back to the career that started it all, journalism. And what a fine time, as Woman’s Sufferage was peaking and World War I was just breaking out- let’s go to Europe! The latter years subjects of Nellie’s stories were more about social reform than attention grabbing gimmicks. She rallied for poor women and mothers and was a champion for orphans. She worked tirelessly…really, as in: she worked herself sick. She neglected her health and medications and a developed pneumonia. 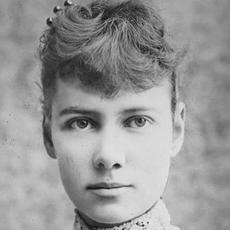 Elizabeth Cochran, Nellie Bly, died at the age of 58 in 1922. While Nellie is often thought of as a role model for young girls, she was only a young daring adventurer for a short time. Most of her life played out thanks to mature hard work, dedication, and an eye for not only a good story, but a way to bring about change. Both of us began our adventure with Nellie by listening to the Librivox recording of Around The World in 72 Days . Download from itunes or check out their website! You can read that as well as 10 Days in a Madhouse online . Yes, we know, some of you are more visual learners! There is a PBS American Experience for that! 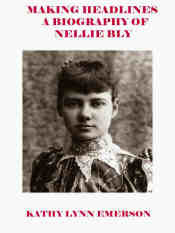 Is there a Nellie Bly website? Of course there is! Right here It seems aimed at a youngish demographic, but there is a lot of research material on it that is not all juvenile. You know what would be neat? If someone made a musical out of Nellie’s story! Oh wait, they did! If anyone has ever seen this, we would love to hear what you thought! Stunt Girl! The Musical! Thanks for another great podcast. I was wondering, what is the song that plays at the end of this one?